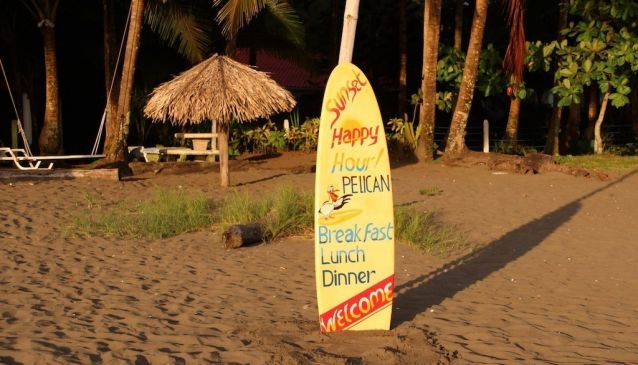 The Pelican Hotel in Esterillos, Costa RIca is a small hotel with 14 beachfront rooms, all less than 50 meters from the Pacific Ocean. The beachfront inn is the perfect portal to a restorative vacation. All of the rooms are air-conditioned, have ceiling fans and private bathrooms with hot water. The full service restaurant & bar provides you with an excellent choice of breakfast, lunch or dinner menus. The beachfront dining area is a breezy, open-air room accented with beautiful Costa Rican hardwoods. Enjoy a game of pool on the beautiful hand made table or try boogie boarding on one of the boards available for guest use. On site surf rentals and lessons can help make your vacation an exciting and challenging one. Or maybe you would like to have a relaxing massage, either in your room, or outside in our beachfront rancho, listening to the soothing sounds of the ocean. In the Pelican's open-air, breezy ocean view restaurant and bar you will enjoy delicous fresh seafoods, tender filet migon, perfectly grilled chicken, an assortment of pastas and a healthy choice of salads. Let's not forget the scrumptious white marlin (or shrimp) ceviche, hamburgers and club sandwiches. All while enjoying the beautiful view to the beach.